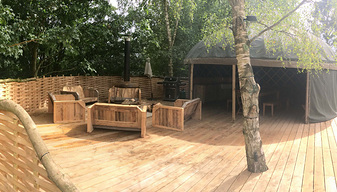 We have seven beautifully converted self catering holiday cottages and five luxury yurts sleeping between two and ten people located in the immediate area around The Garlic Farm. 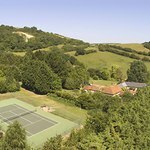 A tennis court, football pitch and games room are available exclusively for our guests. Our renowned onsite restaurant serves breakfast and lunch everyday with discounts for our guests. 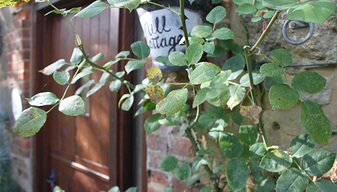 All our cottages are equipped with free WIFI. We can book discounted ferry crossings on all routes. 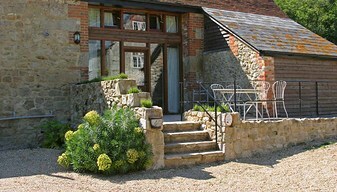 Dogs are welcome in the cottages and each has its own enclosed garden space. We are ideally located for exploring the Island on foot or bicycle. There is a private fishing lake 1/2 a mile away and beaches no more than 10 minutes by car. 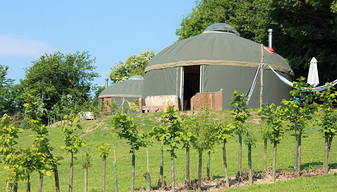 The cottages and yurts can also be booked together for group accommodation for up to 50 people. 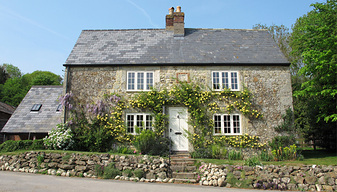 Click on the cottages above for more information, current availability and booking. 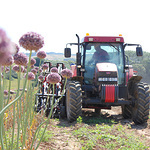 accommodation@thegarlicfarm.co.uk or call 9am - 6pm Mon - Fri tel: 01983 898477. 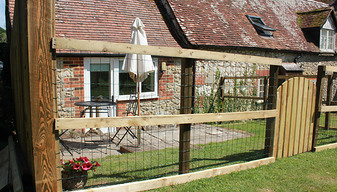 The Garlic Farm Accommodation is part of the Wight Farm Holiday group offering exceptional bed and breakfast and self catering accommodation in unique countryside locations across the Island. Mersley Farm (AKA The Garlic Farm) is a working farm growing garlic and with a small herd of highland cattle, a few horses and chickens. 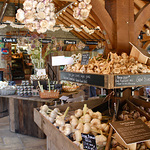 The Garlic Farm Shop located in the farm yard sells all our unique garlic products, plus a range of Island products. We also have a restaurant open for lunch every day serving a selection of delicious freshly prepared meals by the experienced Island chef, Phil Hopkins. The restaurant has already received much acclaim for the quality of its meals. We also serve delicious breakfasts from 9am until 11am. A ridge of chalk downs extends across the centre of the Isle of Wight from east to west. Drive over the top of Mersley Down as you approach the village of Newchurch and you will see Mersley Farm nestling in its sheltered position 300 ft below. 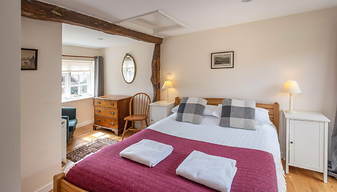 Surrounded by unspoilt scenery and ½ a mile from a main road, it is the perfect setting for a relaxing holiday, yet the nearest beach is no more than 10 minutes drive away. Mersley looks over the valley of Newchurch, and the rolling Island countryside towards Godshill and the south of the Island. 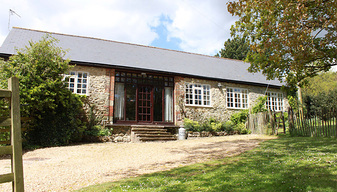 The Farm is one mile north of the village of Newchurch with it's prominent and interesting 11th Century Church and 18th Century Pub (The Pointer Inn), now serving excellent meals. 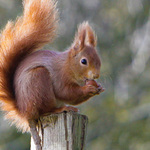 Shopping areas are not far away as we are 4 miles from the main Island towns of Newport and Ryde. 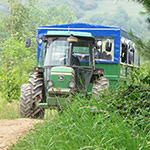 The farm lies at the hub of the 147 miles of bridle, cycling and footpaths for which the Island is famous. A ten minute walk from the farm onto the Downs will reward you with some of the most exhilarating views of the Island, over the Solent to England and far across the Channel. Other sports available locally are fishing, sailing, cycling, windsurfing, surfing and riding. We are happy to provide advice and information, and help arrange any of these activities on request. Around the farm there are plenty of open spaces ideal for children to play including a football pitch with goals and a hard tennis court available to our visitors on request. We also have a games round with pool table, table tennis and games console. We would like to introduce you to our farm pets. 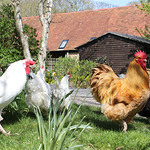 We have a number of clucking hens who are always keen for feeding and sometimes lay us a few eggs. It is likely you will be given a warm welcome from the peacocks and black pigeons. There are also our resident highland cattle who you'll usually find in the field opposite the farm minding their own business in a 'don't-mess-with-us-and-we-won't mess-with-you' kind of way. Dog friendly • Perfect for families with kids of all ages. 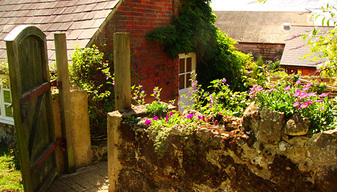 We also have two smaller properties ideal for couples.